Mod is essentially discontinued since warlocks no longer need a mod such as this. If another mod idea comes to mind that would help with the new soulshards, then there will be further releases. 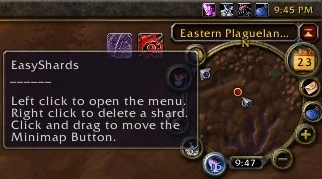 EasyShards is a small little mod which will automatically delete any excess soulshards outside of a warlock's soulbag. It is also easy configureable (by slash command or GUI menu) to simply warn when there are excess shards instead of deleting, or set a certain number of shards that are allowed to be outside the soulbag. If the warlock doesn't have a soulbag, it can be set to how many shards are allowed to take up space in your bags. Deleting (or warning) of excess shards is done automatically on gaining them, or you can do it manually by right-clicking the minimap (and soon to be LDB) button. Added a soulshard count to the minimap button, so you can see how many you have from a glance there which can have its color configured in the menu. Also added rightclick functionality to delete a single soulshard to the minimap button and LDB display (consequently there is now a LDB display that can be shown on Titan/Fubar/other compatible displayer). 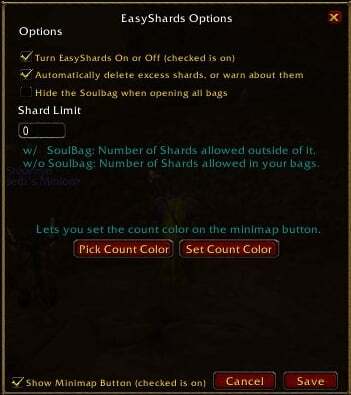 With future versions I might integrate more soulshard related things then simply deleting or warning about excess shards, such as a feature to keep soulshards in a certain bag (especially useful for warlocks without a soul bag, but also useful for those that allow a certain number of shards outside their soulbag) and so on. After playing my warlock again, I realized that with the change to drain soul giving the possibility of gaining multiple shards, my old 'delete soulshard, drain soul' macro was obsolete. After a short time of leveling as afflictiction, my bags were completely full of soulshards, and hence the idea for this mod was born. In essence, any time you gain a new soulshard outside of a soulbag it is instantly deleted, it will not touch the soulbag itself. 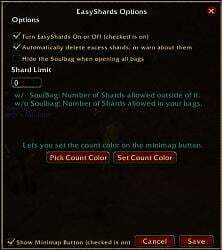 This means that soulshards will simply stay in the soulbag and not fill up all your other bags. 3.3 Compatibility and TOC Update. Also a bugfix for the 'only on-person bags' opening with open all bags keybind when the bank is open. 3.2 Compatibility and TOC Update. Essentially just an update for the TOC, so that 'load out of date addons' does not need to be checked, since EasyShards was 3.2 Compatible already. EMLib Update. Added a count to the minimap button, so that you can see how many shards you have by looking there, which can have its color changed via the gui menu. Added LDB support (so it can now be shown on Titan/Fubar/other LDB compatible displayer). Added option to delete a single shard by right-clicking the minimap button/LDB display (default behavior) though the rightclick functionality can be set back to clearing excess shards with /es rightclick clearshards. Lastly, the minimap button will now smartly update its tooltip to show what it will currently do on rightclick (delete single shard, or clear all excess shards). Added the 'hide soulbag' option to slash and menu, which when toggled on will prevent the soulbag from opening when opening all bags (such as the shift-b default keybind for opening all bags). Also, changed the order that the mod deletes shards, it will now start from the backpack, and then move to bag 1 (first left from backpack), then bag 2, and so on. Initial Release, has a GUI menu for configuring options, as well as slash commands. Has the ability to toggle between automatically deleting excess shards or simply warning about them to chat, as well as setting a shard limit. I use NeatFreak for organizing bags, although I hear that BankStack is good too. Last edited by xtoq : 08-19-09 at 05:25 PM. Posted info in the bug-reports. Just wondering what do you use for your bags? I tried "luggage" early on, I liked the concept, but had some issues. I may need to look into it again. Default blizzard bags personally, though I use bankitems as well (though that is not for organizing bags, like Bagnon and other all-in-one bag mods), for the being able to easily see what any of my chars has in their bags, bank, guildbank, equipped, mail, auctions, currency, etc.. As well as being able to search and see who if any have an item, how much and where. Forgot to say, thanks for posting the replies on the bug report, commented as well, but essentially was just saying glad it's working for you now and if others think such a support would still be good to have to let me know. Last edited by EVmaker : 07-28-09 at 07:46 PM. I use Bagnon to show all my bags as one frame. After installing EasyShards the "B" button (which I mapped to open all bags) now open all the bags, but in the default config i.e. Blizzard style. If I open the bags by clicking on the backpack or any other bag I get the Bagnon version. Also I clicked on the config menu trying to move it and got an error. I didn't get a chance to copy it, so I will recreate it and enter it later. Here is the error if I try and move the frame. I'll be adding this to the bug report section of the portal shortly, so please keep an eye on the report there for updates. That said, I believe I'll be able to have the frame issue fixed before too long. The other I'll need to do some research, as I personally don't like 'all-in-one' bag mods, so I'll need to grab bagnon to test with. I've gotten the bug report up there, I've commented on it about having added Bagnon support, and the frame moving issue. I've also posted there a question to you, so if you could head there and post a reply when you read this, that'd be great. Last edited by EVmaker : 07-28-09 at 03:14 PM. Last edited by ricks322 : 07-28-09 at 12:59 PM. Release the next version which should solve your problem. It should now remove shards from the backpack first, then go to the next bags in line (next being the one directly left of the backpack, then the one left of that, and so on). Also added a feature request from another about not opening the soulbag when opening all bags (slash command menu toggle, off by default). Okay. Nice mod! I don't use a shard bag since I generate so many shards during boss fights. My request: Can you have the shards removed starting with the fixed Backpack first? I try to keep the Backpack empty most of the time. I move my shards to the left-most bag. When I first ran the mod I had 8 shards above my cut off. All deleted shards came from left-most bag. I had to move the extras from my Backpack. As I gained new shards, the mod removed them from the left-most bag and left the new ones in the Backpack. Other than that, thank you for a very nice tool! Sure, I'll add that to the portal under feature requests for EasyShards. It'll probably make it into the version after the next version though, as I'm currently working on 3.2 compatible versions of my mods, and have them all basically ready for release already.